Author’s note: This letter was written in 2006, more than a year before book seven was released. I was blown away when J.K. Rowling took the time to answer a few of the questions. What I never expected was what came next. Jo bestowed upon us a prestigious ‘Fan Site Award’. 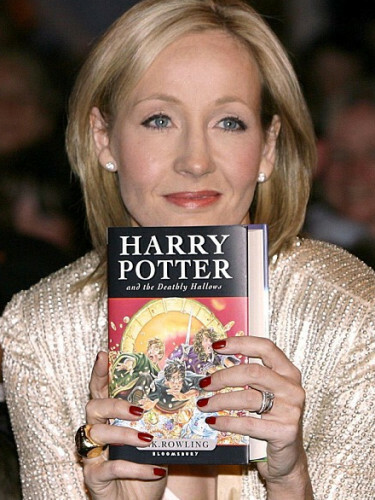 Thanks so much, Ms. Rowling! I’m sure I speak on behalf of every Harry Potter fan when I say how sincerely grateful we are for the time and effort you give to your fan base, particularly to the online community of news-craving, rumour-hungry, plot-demanding and answer-prodding fans. We are ever grateful for the opportunities you have provided to the fandom, particularly through your website. With this in mind, your publicist suggested to me that the idea of an open letter (as two fellow fan sites did a few years ago) could be revisited, post-book six. Of course, I jumped at the chance, and with the help of our fan base (particularly your loyal readers Down Under), and a few swigs of a certain molten gold potion, we put together the following. We don’t think any of these questions drift into uncharted waters (or – for that matter, demand we go there), though feel free to hurl any of them into the nearest vanishing cabinet. In essence, this letter was put together in an attempt to help us in our fanatical attempt to fill in just some of the missing pieces of this most wonderful and amazingly detailed puzzle that you’ve created for us. Are Alecto and Amycus (the two sibling Death Eaters) the Carrows mentioned by Snape in Spinner’s End? J.K. Rowling’s answer: Yes, they are. What houses were Tonks and Myrtle in? J.K. Rowling’s answer: Hufflepuff and Ravenclaw respectively. Was Bob Ogden a relative of Tiberius Ogden, of the Wizengamot? Is Marcus Belby (the Ravenclaw boy in the Slug Club) at all related to Flavius Belby, the famous Wizard mentioned in Fantastic Beasts and Where to Find Them? What is Draco Malfoy’s Patronus? J.K. Rowling’s answer: As of the end of Half-Blood Prince, he has no idea how to produce one, so nobody knows. You must remember that the ability to produce a Patronus demonstrates an advanced level of magic not routinely taught to young Hogwarts students (hence the surprise of the prospective members of Dumbledore’s Army when they find out that Harry can make a Patronus). We learned in book six that Merope Gaunt staggered into the Stockwell Orphanage on New Year’s Eve and gave birth to Tom within the hour; however, it’s unclear as to whether or not Tom’s birth occurred before midnight. Was Voldemort born on December 31, or January 1? J.K. Rowling’s answer: He was born on December 31st. What are the properties of Draco’s wand? Can we assume that its wood is Hawthorn, as per following the Celtic chart posted on your website, or is this only applicable in the case of the trio? J.K. Rowling’s answer: Interestingly (to me) I decided that Draco had a hawthorn wand independently of the chart. So yes, it is hawthorn, and by a bizarre coincidence I assigned him that wood, as I assigned Harry holly, without realising it was the ‘right’ one. Spooky… but for various reasons hawthorn seems to suit Draco as holly suits Harry. Are Zacharias and Hepzibah Smith in any way related? How did the Hogwarts ghosts come to represent the houses they belong to? We know that they were in their respective houses, but were they “assigned” to the task, as such? On your website, you mentioned that Veritaserum is in no way foolproof, and that a dedicated Witch or Wizard could find a method to evade its purpose. In a similar fashion, are there ways to mask the detection of Felix Felicis, for example in a sporting event or examination? You generously donated a copy of the Black family tree for the benefit of Book Aid International, and it revealed that a Charlus Potter married a Dorea Black (it also states that they had one son). Recently, the fandom has been busy speculating as to whether or not Charlus and Dorea are directly related to James, and moreover, Harry (particularly because the dates fit so well). Are we on the right trail of thought here, or has the fandom pulled another Mark Evans? Is Spinner’s End Snape’s permanent residence? We know he probably lives there during the summer (as of book six, certainly), but is this where he grew up? If not, who occupied the house before Snape? Was anyone else present the night that James and – oh, we know – CONSTANT VIGILANCE! From the bottom of our hearts, Jo, thank you – we are sincerely hoping that your chosen writing implement is continuing to explode with the magic of Harry’s final adventure.